The name R. D. Laing continues to be widely recognized by those in the psychotherapy community in the United States and Europe. Laing’s books are a testament to his breadth of interests, including the understanding of madness, alternatives to conventional psychiatric treatment, existential philosophy and therapy, family systems, cybernetics, mysticism, and poetry. He is most remembered for his devastating critique of psychiatric practices, his controversial rejection of the concept of ‘mental illness,’ and his groundbreaking center for people in acute mental distress at Kingsley Hall, London. Most of the books that have been published about Laing have been written by people who did not know him personally and were unfamiliar with Laing the man and teacher. 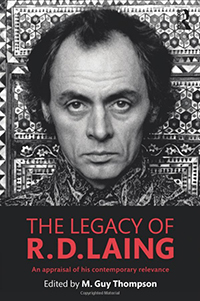 The Legacy of R. D. Laing: An appraisal of his contemporary relevance is composed by thinkers and practitioners who knew Laing intimately, some of whom worked with Laing. This collection of papers brings a perspective and balance to Laing’s controversial ideas, some of which were never addressed in his books. There has never been a collection of papers that address so thoroughly the question of who Laing was and why he became the most famous psychiatrist in the world. As M. Guy Thompson’s collection illustrates, there are now a number of alternatives to psychiatry throughout the world, and much of this can be credited to Laing’s influence. The Legacy of R. D. Laing will ensure the reader has a keen grasp of who Laing was, what it was like to be his patient or his friend, and why his thinking was far ahead of its time, even in the radical era of the 1970s. It is timely to appraise the nature of his contribution and bring Laing back into contemporary conversations about the nature of sanity and madness, and more humane approaches to helping those in profound mental distress. This book offers an in-depth insight into the work of R.D. Laing. It will be a must read for psychoanalysts, psychotherapists, family therapists, psychiatrists and academics alike. M. Guy Thompson, PhD is a Personal and Supervising Analyst at the Psychoanalytic Institute of Northern California and Chairman of Free Association, Inc., a non-profit organization devoted to the dissemination of Laing’s ideas, in San Francisco. Dr. Thompson received his psychoanalytic training from R. D. Laing and associates at the Philadelphia Association and is the author of numerous books and journal articles on psychoanalysis, phenomenology, and schizophrenia. He currently lives in San Rafael, California. REVIEW: Alex Miller Tate, Marx & Philosophy Review of Books, 13 May 2016.